Today May 25, 2016 is World Thyroid Day. Today is the day we SAVE BABIES. I wonder if I am crazy to think I can change the world, but something deep inside me tells me that this is what I am supposed to do. I launched my blog Hypothyroid Mom on October 1st, 2012 in memory of the unborn baby I lost to hypothyroidism and in dedication to my two boys who beat the odds and made it to the world. When I wrote that first post Have You Suffered A Miscarriage? Your Thyroid Could Be To Blame the words poured out on the page as if someone other than me wrote it. Somehow I knew my unborn baby was watching over me. I know my mission to bring about UNIVERSAL THYROID SCREENING IN PREGNANCY is my destiny. I lost my unborn baby needlessly. I will ensure my baby did not die in vain by saving babies all across the globe. With your help I will make this happen. So many readers have contacted me with stories of miscarriage, still birth, pregnancy complications, premature births, and babies born with life-changing challenges. There is no better way to stress the importance of thyroid screening in pregnancy than to share the heart-wrenching real life stories of thyroid sufferers. How many babies suffer before we shout for universal thyroid screening in pregnancy? This is the moment we stand up, speak up and demand change. Why I created Hypothyroid Mom? You may wonder why I created Hypothyroid Mom. There I was a woman with zero blogging experience and no clue how to use Facebook or Twitter. Who was I to think I could change the world? The truth is I created Hypothyroid Mom out of pure rage. 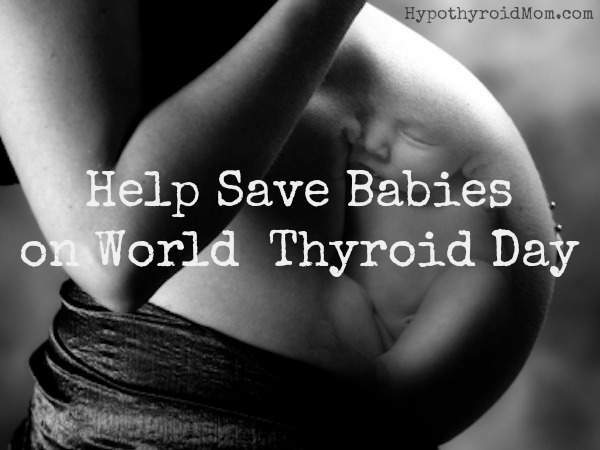 In early 2009 I lost my unborn baby unnecessarily to maternal hypothyroidism. I trusted my award-winning, Ivey-League trained, New York City doctors to know how to treat my thyroid disease in pregnancy. I didn’t question them, even when my symptoms were raging so high that I was struggling to stay awake, because I thought “doctor knows best”. My TSH soared far above the recommended range for pregnancy endangering the life of my fetus and I miscarried. I have to live with that regret for the rest of my life. The day I lay on that medical exam table waiting for the D&C to remove my child a rage so deep filled me as I stared up at the ceiling. I vowed that moment to research all I could about thyroid disease in pregnancy and warn women everywhere. After 6 years of extensive research and a quest to find the best thyroid experts in the world, I am now thankfully in the best health of my life. I got so thyroid healthy that at age 40 I gave birth to my second son Hudson in October 2010. The child that my doctors told me would never happen for me DID and I am forever grateful. My sons Benjamin and Hudson are the light of my life and I, Dana Trentini, have come from the depths of hell to this place of bliss. I know there is hope to have healthy babies despite thyroid disease, because hope happened to me and I want the same for every woman with thyroid disease. There is currently NO universal thyroid screening in pregnancy despite mounting evidence that thyroid disease is a danger to mother and fetus in pregnancy. It’s time to stand up and say ENOUGH IS ENOUGH. I can’t go back and change what happened to my child no matter how much I long to do so, but what I can do is save babies in memory of my child. With up to 300 million people, majority women, worldwide experiencing problems with their thyroid gland, and over half presumed to be unaware of their condition, there is a good chance there are people you know that need this information. I am proud to announce that New York Times bestselling author (my thyroid hero!) Mary Shomon and I have co-authored a new book, Your Healthy Pregnancy with Thyroid Disease: A Guide to Fertility, Pregnancy & Postpartum Wellness! Together we will save babies. Perspective as to how to make a difference. Instead being put on antidepressants etc.